In a live show tonight, TVR‘s expert jury cut the 72 acts of Romania‘s Selectia Nationala 2017 to 15. The acts were judged based on their live auditions at the end of January. The 15 semi-finalists will now face off on 26 February, when ten songs will advance to the national final on 5 March. In case you missed Romania’s live auditions, here is a recap of the 72 entries. Tonight’s show, which stretched over two hours, included guests like Eurovision stars Elena Gheorghe, Cezar “The Voice” Ouatu, Monica Anghel, Marcel Pavel, and Romania’s first representative from 1994, Dan Bittman. They all performed their Eurovision hits as well. They were joined onstage by Luminita Anghel, Paula Seling and Ovi Jacobsen, who were also part of the expert jury, next to songwriters Adrian Romcescu and Andrei Tudor. Along with other TVR hosts, the Eurovision stars presented the 15 semi-finalists in random order. Who are the 15 semi-finalists of Selectia Nationala 2017? The organisers specified that Lora would have qualified with “I Know”, but her withdrawal prompted the jury to select the next act in line, Zanga (“Doua sticle”). How well did we do with our prediction? Earlier today, we made a prediction regarding tonight’s outcome. Out of the 15 acts we picked as semi-finalists, we correctly guessed nine. The most surprising omission was Myriam’s “Escape”, written by Ovidiu Anton. Next up, the 15 selected participants will have to get ready for the semi-final on 26 February in Bucharest, when the expert jury will cut their number to 10 finalists. On the night of the national final of 5 March, the public will decide the winner of Selectia Nationala 2017 by 100% televote. TVR has officially revealed tonight that the National Final will also take place in Bucharest. What do you think about the 15 semi-finalists of Romania’s Selectia Nationala 2017? Who has more chances of advancing to the NF on 5 March? Sound off below! 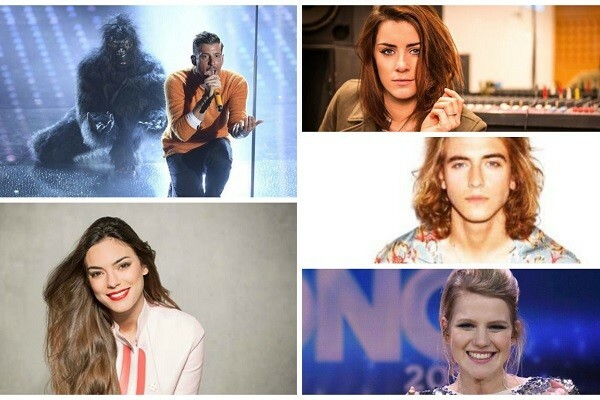 Poll: Who is your favourite Eurovision 2017 Big Five act? That’s a real shame about Teodora. Either song would have been great to put through. Ilinca feat. Alex Florea – Yodel It! “Yodel It”, no doubt. Major standout. And if it’s not chosen, please let it at least be “Petale”. I am in the yodel it camp. It’s a fresh breath of air. Very disappointed by the omission of We Were Young, ah well. “Yodel-it” took me by surprise – this should probably win. Should be a good final. Romania always delivers a good song (except last year, but that was nothing to do with the music). Is there any song that UK does not make fun of? That should not discourage romanians to choose Yodel it! UK will make fun anyway, about anything. yodel it mga ul*l !!!! I find “Yodel it!” plain, boring, dated, not real, no power, nothing. The guy’s voice is not that good, either. It is honestly one of those songs that UK would make fun of in their documentaries about ESC. With this lineup, Romania is probably set to place a little below average, but I can see Yodel it! staying behind in the semifinals. Where is Sergiu Bolota? “We Were Young” is one of the absolute best songs of the Whole national final season. It is a potential MAJOR pan-European hit! Amazing song. Also – where is Koszika? Her song “Closer” was also amazing. These were among my top 3 favorites of the Whole lot that I had heard… so disappointed now 🙁 At least Yodel It is in… it must win for sure now!!!! I honestly hope we don’t send the yodel song, even if only to piss off the wiwi eurofans. Am I the only one who thinks Yodel it is well, good- but doesn’t have enough punch to make it high into the leaderboards? Well yeah the yodel makes the viewers ‘amazed’ and it will be remembered, but this will get an average placement. Yodel it for the win. Yodel It is an outright winner, and has no competition…as far as the other songs go, be it right or wrong, it seems to me the jury have selected the songs on best live performance, rather than the best songs, hence the really good songs …and there were many have not been selected. To all those haters who attack Yodel it: just try to sing/compose such a song then talk. The girl is the one who was singing at The Voice “Cowboy Sweetheart” and the guy was at The Voice next year after her. They both have great voices, good presence, capable of a great live and van bring a good place for Romania if they go to Kiev. The song is a crazy combination who can entartain young and old people as well. So Gooooo, Yodel it! To Kiev! yodel it? really? was yesterday’s dancing gorilla not enough for you? Only one good song – Ramona Nerra – “Save Me”. What the hell! Always expected We Were Young by Sergiu would definitely fly the flag for Romania cause the song is so good, play it all the time.. missed chance ???? Seems that Stig Rasta write a song for the wrong artist(Sergiu Bolota). He is terrible live.. The song is very good also,but Bolota is terrible..
Where the f–k is Sergiu???????? Yodel it all the way to Eurovision! The yodel chick and the hipster guy. Yodel It is the trashy bop that we DEMAND every year, and who else but Romania could bring it to us? I can already see that ANTHEM end top 5 in the televote and bottom 5 in the tasteless jury vote. But still, we need that song. @johanleekens, yes, it’s the same singer. Glad they were chosen. Is the singer from “Yodel it” the same who auditioned for The Voice Romania with “Cowboy Sweetheart”, I actually found that one on the Internet somehow, is she the same I wonder (because she was amazing)?